Iron gates are stately additions to any property, commanding instant attention from passersby and making a strong impression on any visitors. They denote class, success and sophistication, with a touch of old world charm. After you’ve invested in these appealing driveway accessories, remember ongoing maintenance will keep them in great repair, from the hinges to the composition of the wrought iron. To ensure your wrought iron gates always put the right words on everybody’s lips, follow these six simple care instructions. Australia is renowned for its humid, heated conditions and Queensland often experiences the brunt of Mother Nature’s more summery forces. Protecting your iron gates from rain and humidity is easy – apply a protective coat of rust preventing wax to the length of your gate, taking care to lather up the joints. If you’re stuck in a particularly rainy patch, secure a protective tarp to the gates and apply a sealant to stave off any stray droplets (if you have a pool nearby, this would be an ideal precaution even when it isn’t raining). It may be a good idea to give your gates a once over with a fresh coat of powdered paint, revitalising any faded colouring and forming a barrier between the exposed iron and humid air. 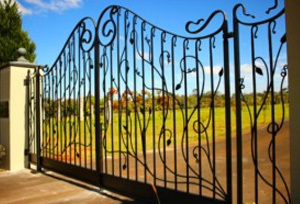 Rust can develop even in the driest of climates, a new coat of colour will ward off any oxidation and nurture the overall health of your iron gates. A dirty fence can become the perfect breeding ground for rust and other issues, as layers of grime and dust disguise potential problems, leaving you none the wiser. Use a mixture of warm water and a non-intrusive soap solution to target any problem areas or build-up, using a toothbrush to really burrow into those hard to reach areas. Regular gate checks will soon reveal any small rust spots – nipping it in the bud now will reduce the damage done to your gate and eliminate the threat of further corrosion. Grab a ball of steel wall or a spare scrap of sandpaper and attack the rust spot until it’s gone, finally coating the area in wax and following up with further checks. 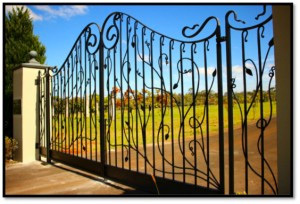 If rust has truly taken a hold, a Brisbane iron fence specialist can help your signature piece to rights. Stop rusting before you get to that level of expense!